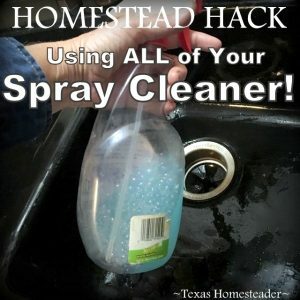 Homestead Hack: Use All Of Your Spray Cleaner!! Cleaning – we’ve all gotta do it #amiright??!! My favorite cleaner is much simplified from my younger days. Back then I’d prance down the highly-scented cleaning aisle picking up whichever cleaner spray had the most eye-catching label. But I recently wrote about how cleaning has become complicated. So my cleaner of choice these days is a repurposed spray bottle with soap & water. Yep, soap & water! Cheap and effective. But sometimes when I’m using that cleaning spray and I’m closer to the bottom of the mixture I have a hard time getting it to spray. I mean, when you tilt that bottle and the spray nozzle attachment doesn’t reach all the way into the cleaner, whaddya do? Oh I’m so glad you asked. Check out this homestead hack, y’all. One day as I was spraying my soapy water to clean my sink and having to manipulate the bottle to make the spray nozzle reach all the way into the liquid I thought there has to be a better way. I need a way to bring up the liquid level without adding more product. I want to use it all! Hummm…. I’VE GOT IT! I’ll displace the liquid with a few marbles! This worked great, the marbles brought the soapy water mixture level up enough where the nozzle could easily reach. Plus the marbles helped position to tube toward the center of the bottle too. Now I’ll admit when I first tried this I was a little over-zealous in how many marbles might be needed. Adding too many marbles just added unnecessarily to the weight of my spray bottle. But I removed the extra marbles and now it works perfectly for me. 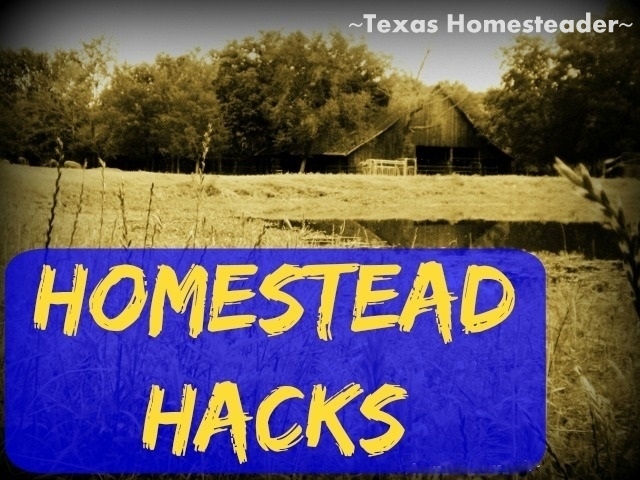 This entry was posted in Blog Posts and tagged Frugality, Homestead Hacks on November 1, 2017 by Texas Homesteader. I learned a trick like this from Graham Kerr “The Galloping Gourmet” many, many years ago. The distinction was that he advised we save leftover wine from oxidizing by filling up the wine bottle (or carafe) with marbles to bring the level of the wine up to the cork, and push out the excess air in the bottle. Who knew that marbles could be good for so many things!